I needed a quick side dish, and I had just bought a bottle of balsamic vinegar. I LOVE balsamic vinegar and believe that any vegetable tastes amazing with it. I broke into a package of frozen green beans - and ta da! 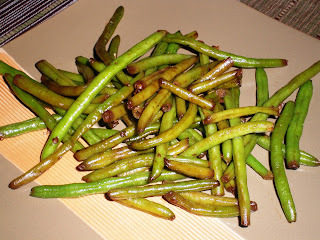 - a yummy side dish. Cook green beans according to package - I placed them in a skillet with a little bit of water, brought it to a boil, cooked for 5 minutes, then drained the water. Add to the skillet the balsamic vinegar and garlic - cook over low heat for 2-3 minutes. Enjoy!